The European Ariane 5 rocket carrying the communications satellites Yahsat Y1A and New Dawn is rolled out to its South American launch pad at the Guiana Space Center in Kourou, French Guiana for a planned March 30, 2011 launch. Communications satellites for the Middle East and Africa are buttoned up for blastoff today (March 30) inside an Ariane 5 rocket. 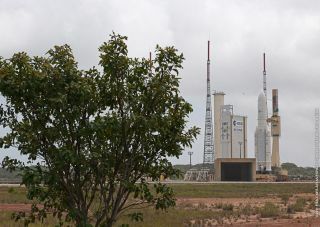 The 165-foot-tall rocket is scheduled to lift off at 2145 GMT (5:45 p.m. EDT) from the ELA-3 launch zone at the Guiana Space Center, a French-run spaceport in Kourou, French Guiana. The Ariane 5 launcher has 67 minutes to get off the ground Wednesday evening or else wait until another day. The European rocket will haul the Yahsat 1A and Intelsat New Dawn communications satellites into an egg-shaped transfer orbit stretching more than 22,200 miles above Earth. It will take 35 minutes for the Ariane 5 to deploy both satellites in the correct orbit. First to separate from the Ariane 5 will be the Yahsat 1A spacecraft. The high-powered Yahsat 1A satellite will be located in geosynchronous orbit along the equator at 52.5 degrees east longitude, putting the craft in range of communications customers across the Middle East, Africa, Europe and Southwest Asia. Operated by Al Yah Satellite Communications Co. of Abu Dhabi, Yahsat 1A will provide direct-to-home television programming, secure Ka-band communications capacity for government and military applications in the United Arab Emirates and other nations. Yahsat 1A will also support communications links for corporate data networks and Internet trunking, according to the satellite operator. "The launch of Yahsat's first satellite is a fantastic achievement and a moment of pride for all involved," said Jassem Mohamed Al Zaabi, Yahsat's CEO. "By expanding our satellite communication capabilities, we are supporting the development of an advanced information and communications infrastructure that will drive economic diversification and social progress across the whole region." Weighing 13,150 pounds at launch, Yahsat 1A is based on the Eurostar E3000 satellite bus from Astrium. Thales Alenia Space of France built Yahsat 1A's Ku-band, C-band and Ka-band communications payload. Yahsat 1A is designed to work in space for more than 15 years. Intelsat New Dawn will ride in the lower position during the Ariane 5's ascent into orbit. Once Yahsat 1A deploys, the rocket will jettison a Sylda dual-payload adapter to make way for the Intelsat satellite's release. The $250 million satellite was built by Orbital Sciences Corp. and is based on that firm's Star 2 platform. The 6,600-pound spacecraft will link Africa, Western Europe, the Middle East and Pakistan through Ku-band and C-band transponders and antennas. Intelsat New Dawn is geared for wireless broadband, television and other media applications. Mostly financed by South African investment houses, Intelsat New Dawn is one of four satellites Intelsat is launching between 2010 and 2012 to bolster the company's presence in Africa. Intelsat New Dawn will be parked at 32.8 degrees east longitude, where it will operate for more than 15 years. Final countdown procedures are scheduled to begin at 1015 GMT (6:15 a.m. EDT). A check of electrical systems is expected around 1415 GMT (10:15 a.m. EDT), and the launch team will begin fueling the rocket with super-cold liquid hydrogen and liquid oxygen propellants at about 1645 GMT (12:45 p.m. EDT). Chilldown conditioning of the Vulcain 2 first stage engine will occur at 1845 GMT (2:45 p.m. EDT), and a communications check between the rocket and ground telemetry, tracking and command systems is scheduled for 2035 GMT (4:35 p.m. EDT). Once above the dense atmosphere, the launcher's payload fairing will fall away at an altitude of nearly 70 miles. The Ariane 5's first stage will shut down at 8 minutes, 53 seconds, followed moments later by stage separation and ignition of the hydrogen-fueled cryogenic HM7B upper stage engine. The rocket's upper stage will fire for more than 16 minutes, accelerating to a velocity of 5.8 miles per second to reach an orbit with a planned high point of 22,236 miles and a targeted low point of 155 miles. The release of Yahsat 1A is scheduled for 27 minutes, 27 seconds. The rocket's barrel-shaped Sylda 5 dual-payload adapter will be jettisoned a few minutes later. Intelsat New Dawn will separate from the lower portion of the payload stack at 35 minutes, 2 seconds. Click here for Spaceflight Now's coverage of rocket launches and all Arianespace and other spaceflights.